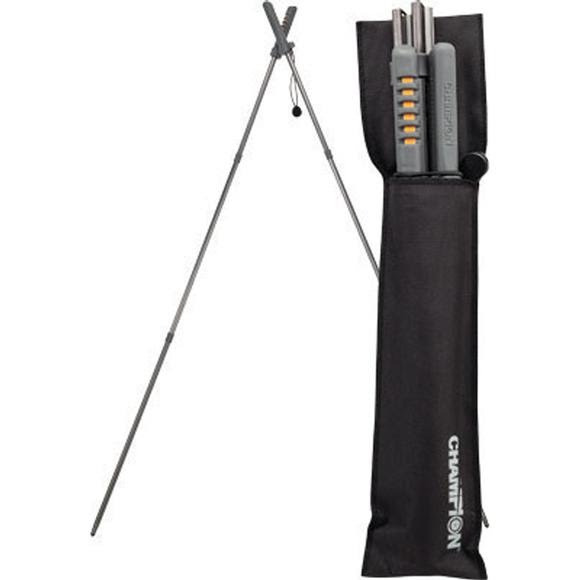 When that tough shot presents itself, be prepared with Champion's new, easy-to-use Shooting Sticks. This handy hunting tool effortlessly assembles in seconds as shock cords quickly pull together and lock legs into place. The compact, lightweight Folding Shooing Sticks work well in all types of terrain, steadying the shooter for a quick, clean shot. When that tough shot presents itself, be prepared with Champion&apos;s new, easy-to-use Shooting Sticks. This handy hunting tool effortlessly assembles in seconds as shock cords quickly pull together and lock legs into place. The compact, lightweight Folding Shooing Sticks work well in all types of terrain, steadying the shooter for a quick, clean shot. They also include a handy belt pouch for your convenience.